Plant Profile: Drosera spiralis, updated |Sundews Etc. 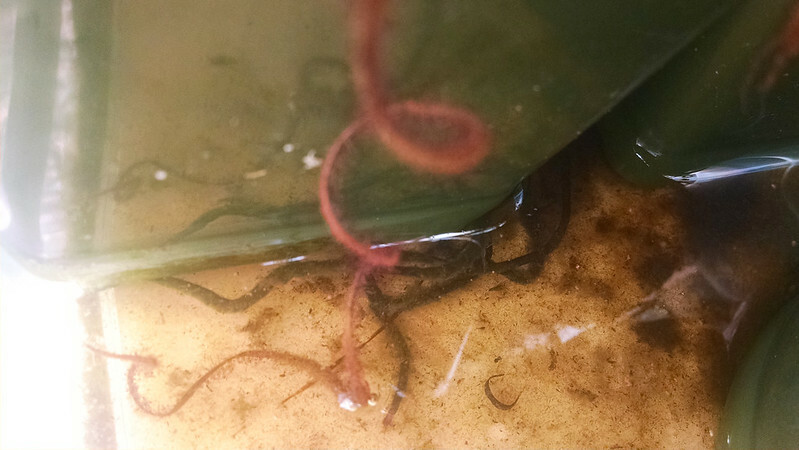 This is part of a series of posts describing my experiences with different species, their culture requirements, and photos of their growth in my collection. The full series can be read here, or by species on the Series page. 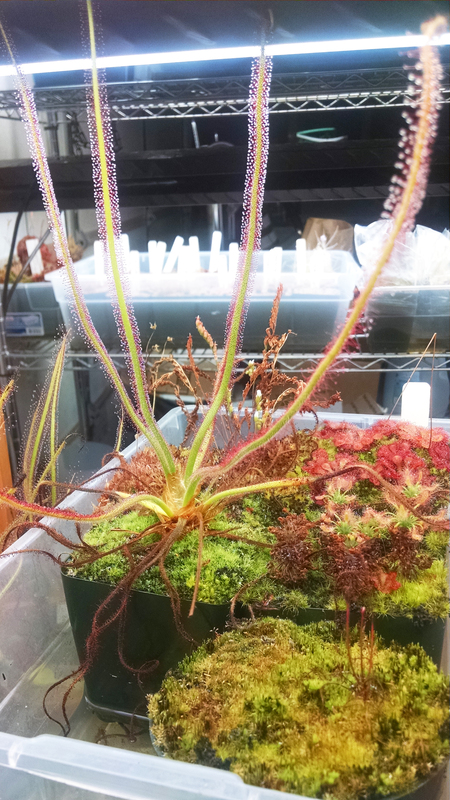 About a year and a half ago I did a Plant Profile of one of my favorite sundew species, Drosera spiralis. A lot has happened in the mean time, so I decided to do an update. Here's what my plant (and my collection) looked like back in April 2014. The halcyon days of yore. And here's the same plant today! I didn't realize they got this big, hahahah. It was really hard to photograph because of how big its gotten. The leaves are more than 9 inches (23 cm) tall, which means they end up growing into my lights sometimes. It's a big robust plant, and has proven very easy and vigorous in my conditions. 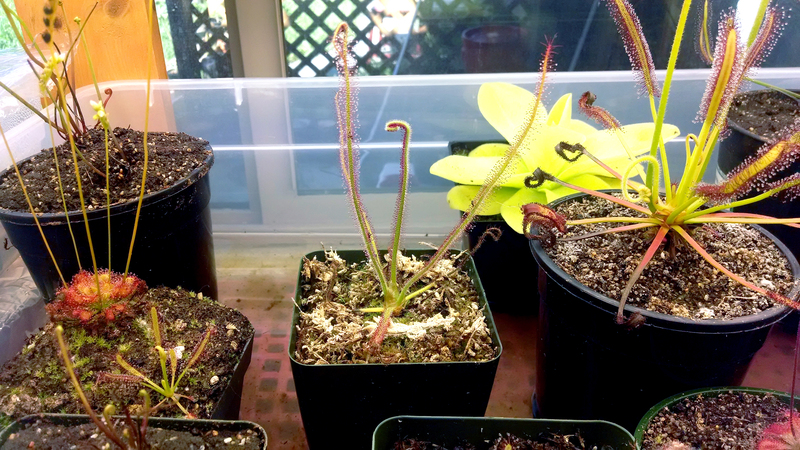 This was like the 3rd or 4th sundew I acquired, at the Winter 2014 BACPS meeting. That's where we all learned the difference between D. spiralis and D. gramnifolia. One of the tests was how the leaves unfurl. Of course, taxonomy being what it is, the plants don't always cooperate. 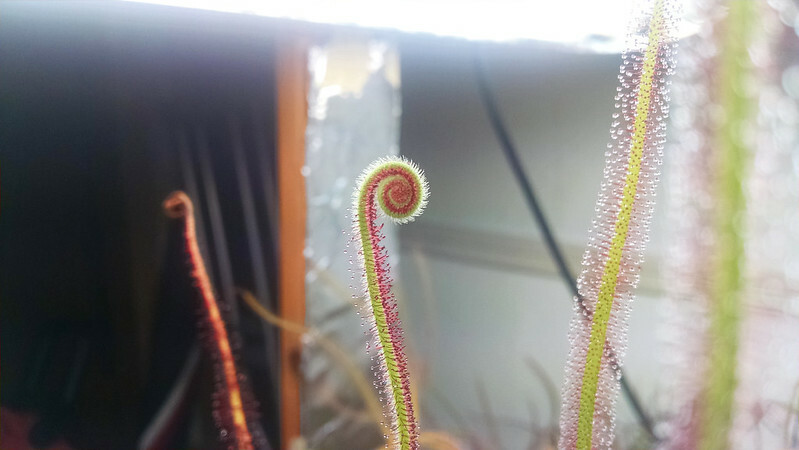 A uniform spiral, technically characteristic of D. gramnifolia. More what a D. spiralis leaf is "supposed" to look like. One of the things that I learned was that D. spiralis is a difficult, temperamental plant that might just up and die on me at any minute. That hasn't proven to be true. I suspect that two things make this plant happy in my conditions: extremely bright light, and consistently cool nighttime temperatures. 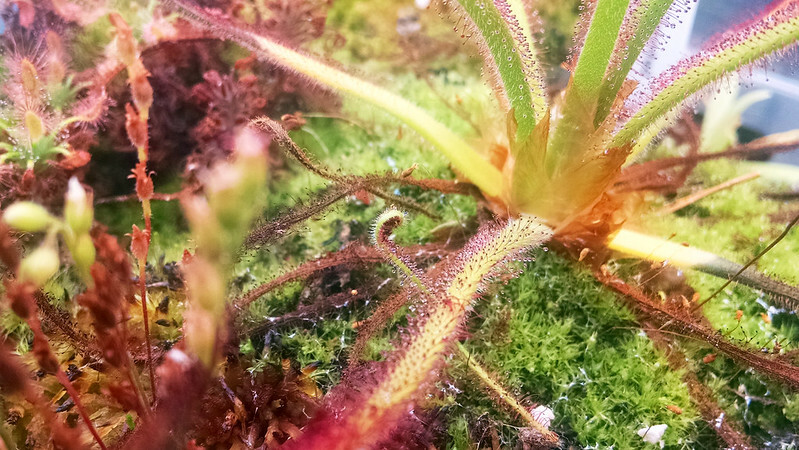 Longer-leaved sundews always do the worst in low light, and the mountaintops where this is found in habitat are pretty much always chilly at night. I had enough success with this formula that I've even flowered the plant twice! Check out those stipules too, those are sweet. 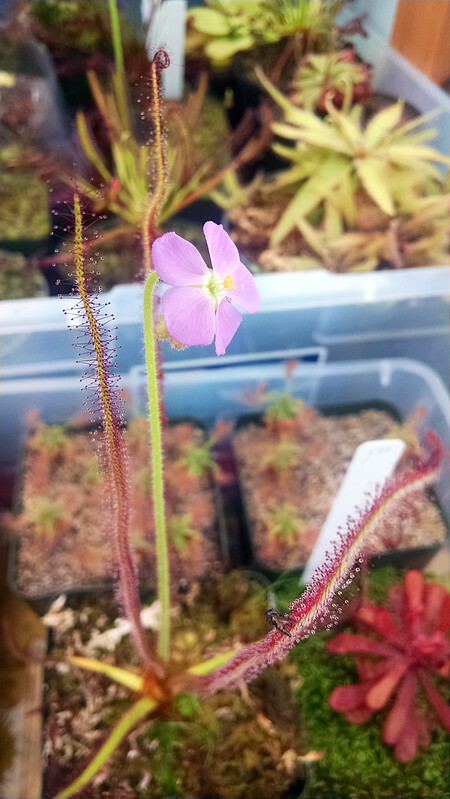 Best Drosera flower I've seen in my collection so far. The second time it flowered the plant even managed to set a bit of seed. I sold the excess, but I've saved some to try cultivating. Another thing I want to try is root cuttings. The plant has sent out long roots into the tray that are just ripe for propagation. Basically, this plant wants highland conditions, but with very bright, intense light. Since I've moved my collection into the garage (where it's even cooler) it's just done fantastically. 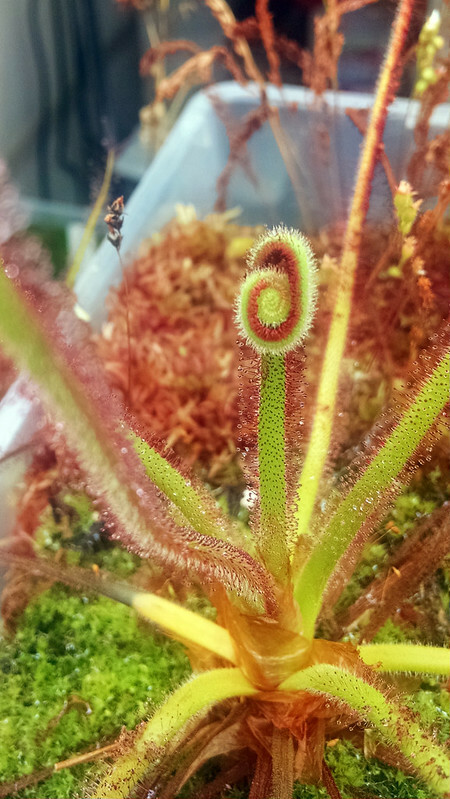 If your Drosera capensis look really fantastic, there's a chance you could grow D. spiralis as well. It's worth a shot anyway. And don't forget to feed them! The mature plants don't move their leaves, but they'll curl all the tentacles in to feast. And little babies even roll up on the food, like this sproutling that appeared a few months ago next to the mother plant. You go little plant. Eat that fish food. feeding: feeding fresh leaves is good. That looks fantastic! It is so happy in your conditions! Thanks Natch! I'm really proud of this plant. Nice, yours is growing amazingly! I just got a couple of these and have some in peat/sand and some in LFS/vermiculite/sand/API (Arcillite/Zeolite). Think I might switch one over to an LFS/growstone mix for comparison. Awesome! I got my first D. spiralis from Native Exotics last Sep. It flowered for me too in Dec. Now I got some seeds. I sowed 1/2 on sphagnum, and the other 1/2 on peat/sand mix yesterday. How did you sow yours? Do you know how long it takes to germinate? I haven't sown them yet! I've been lazy. Generally though, sundew seeds germinate sometime between 2 and 8 weeks. The longest I've ever had them take was 4.5 months. 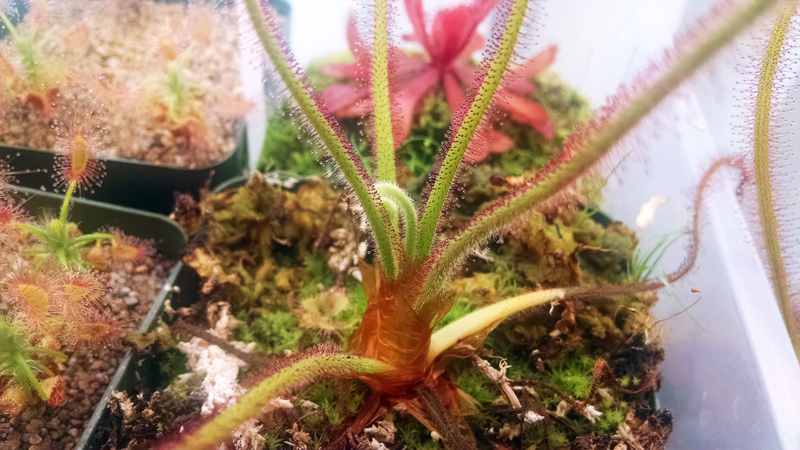 Is it possible to keep it happy even if the photoperiod changes from 14 hours to 10 hour from summer to winter and vice versa? Thanks!